The dog owner (and everyone else who is connected with the dog) is protected from liability as to the first injury caused by the dog, unless liability can be based upon other grounds. The dog owner, harborers and keepers will be held strictly liable for dog bites and other harm caused by a known dangerous propensity of the dog. For example, if the dog previously bit someone, and the owner knew about it, then the owner will be responsible every time the dog bites anyone else. Liability results from keeping a dog that was known to hurt people. The key to this type of liability is knowledge (which the law often refers to as "scienter"). For more information about the "one bite rule," see The One Bite Rule on this website. A "mixed dog bite statute state" is a state having a dog bite statute that substantially embodies the "one bite rule" while containing some degree of strict liability. These states appear in the list of statutory liability states because, indeed, they impose statutory liability upon dog owners under limited circumstances. Therefore they have to be regarded as being a little of both -- statutory liability states but also one bite rule states -- and reference must always be made to these two different areas of law. Even if you live in a one bite state or mixed state, keep in mind that owners and others can possibly be held liable for (a) negligence, (b) premises liability, (c) violation of a leash law or other municipal law that leads to injury (see below for more information), (d) intentional conduct involving the use of a dog, and (e) outrageous or reckless behavior involving the use of a dog. You absolutely require the help of an attorney to know whether your state will permit recovery upon any of these other grounds. 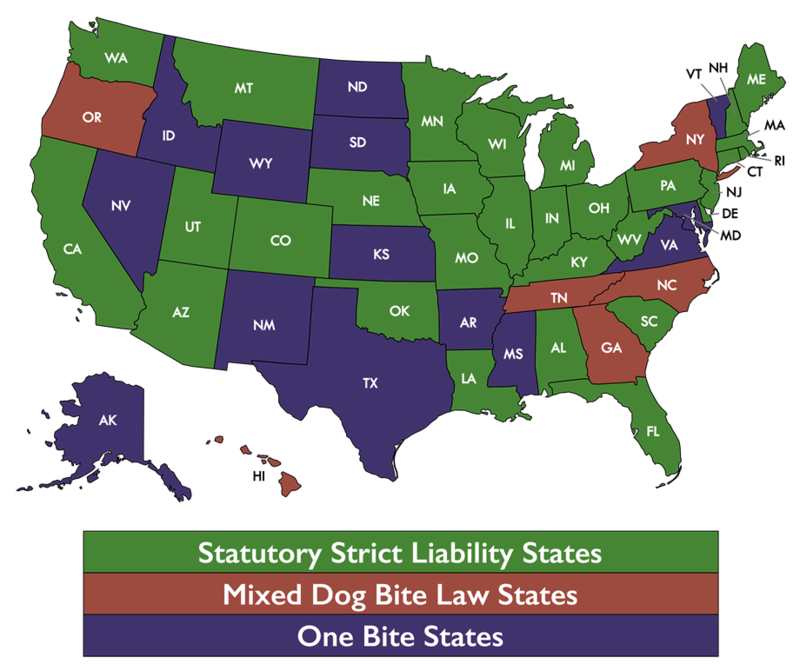 The "one bite states" do not have dog bite statutes, and the mixed dog bite statute states have complicated statutes that are challenging even to attorneys. This means that only a person who is skilled in legal research will be able to form a competent legal opinion about the particularities of dog bite law in these states. This makes it even more important to retain an attorney if your case arises in a "one bite state" or mixed dog bite statute state. For more about this, see Does An Adult Need a Lawyer For a Dog Bite Claim?, and Should Parents Get a Lawyer For Their Injured Child? The mixed dog bite statute states are listed in the prior section.